According to the 2012 National Foot Health Assessment, 8% of adults over 21 years of age have flat feet. This approximates to about 18 million people. In addition to this, 4% have fallen arches. (1) These numbers show how common the condition is. If you have flat feet, there is a high possibility that the condition will cause pain when standing or walking. Selecting shoes that are specifically made for flat feet is one very important step. 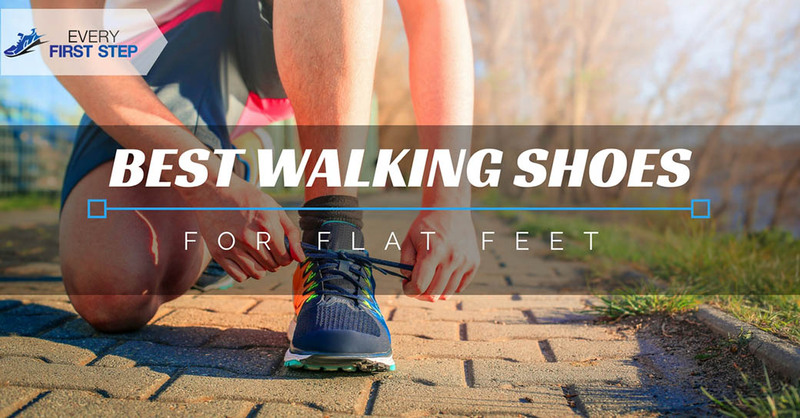 ​In this article, we will discuss the three main types of flat feet, how you should select the right shoe and the five best walking shoes for flat feet. In this kind of flat foot, the foot has a natural arch but becomes flat when weight is exerted such as when you are sitting. (5) The condition usually begins during childhood and continues into adulthood often professing in severity as one age. This condition is often caused by the weakening of the posterior tibial tendon which supports the arch. In many cases, the cause is old age or overweight. When it comes to selecting the right walking shoe for flat feet, your choice should depend on the activity you are engaged in and your gait. If you are on your feet most of the day, you need to find a shoe that is comfortable enough for extended wearing. If you examine how you walk, you will probably have an idea which aspects of your gait require extra support. With this knowledge in mind, you can find the feature that you need to have to give you the right support. These are also called lightweight performance shoes. They are ideal for those who have neutral feet and are flexible and lightweight and allow the wearer to achieve the speed and performance they want. When compared to other walking shoes, however, they may lack durability. These are very supportive and are ideal for flat feet. They are durable and commonly have a dual density midsole for extra support. They also have thigh heels but not as thick as the ones in a motion control shoe. They give good reinforcement to the arch of each midsole. The main feature that motion control shoes have is that they are quite heavy. They are designed to be rigid and limit overpronation. They are also known to be durable making them ideal for overweight people. One of the problems is that they have a thick heel that can make walking difficult. Flexibility - make sure the walking shoe allows you to roll your foot naturally during each step so as not to strain the leg muscles. Lightweight - ideally, the walking shoe should feel like you are walking bare feet. Heavy shoes only make you tire faster and strain your muscles. Flat heel - flared heels are ideal only if you are walking on uneven surfaces because they provide extra stability. For regular walks, choose a flat heel on the other hand for great walks, go for a flared heel. Good traction - the outsole of the foot should have grooves to help with traction. This will keep your feet safe even on slippery ground. This is very important if you plan to walk on uneven surfaces such as trials. Arch support - shoes that have insoles to provide the cushion for your arches are a good choice for walking. This supports your arch as you walk. Round front - walking shoes should ideally be rounded on the front so they do not cause any foot problems such as bunions. Also, make sure that the toe box provides ample space for your foot. Cushioned heel collar - this is a good feature that helps ensure you get a proper fit. Although it will be difficult to find a shoe that excels in all of these factors, there are a handful of options that meet the criteria. In the next section, we’ll give you a roundup of our five recommended walking shoes for flat feet. Looking for a walking shoe that can work well on different surfaces? The Rockport We Are Rockin Chranson shoe is a good option. It provides a durable grip on a variety of surfaces. It also has lightweight material to help reduce foot fatigue. Another feature is the latex footbed that has extra cushioning and the mesh lining to enhance durability. The shoe also has shock absorption qualities. For those who are serious walkers and want a shoe that looks more athletic, the New Balance MW411V2 are a good option. They come in white, gray and black and have the appearance of a running shoe. Another good point is that they have a rubber sole which ensures good traction on different surfaces. The shoe also provides great cushioning and are also lightweight which are very important features to in walking shoes. If you are on-the-go kind of person and want to have a shoe that you can slip on anytime, the Sketchers Go Walk 4 Walking shoe are a good choice. They are simple yet elegant and easy to wear. The material used is highly breathable making it ideal for those who have sweaty feet. Another good feature is that they are easily expansive and can blend with whatever foot shape you have provided a snug yet comfortable fit. The shoe also comes in a variety of colors. The New Balance WW577 walking shoe falls provides good cushioning while remaining durable on the outside. If you are looking for a shoe that can withstand different elements but still gives ample comfort, this is a good option. Another feature is the shock absorbing nature of the heel that enables you to remain balanced even on uneven surfaces. The shoe is ideal for trail walkers who need extra stability and traction. For those who want a pair of walking shoes that doesn’t look bulky and has a nice slim, fashionable appearance, the Easy Spirit AP1 Sport walking shoe is a good option. The shoe comes in a variety of colors from white to black and beige and is ideal for day to day use. The insole of the shoe is also removable allowing you to replace it with something more suitable if you like. The sole is made of rubber so it provides ample traction. Selecting shoes for walking is a whole different story from selecting a pair of running shoes. Cushioning and flexibility are two of the most important features to look for. No matter what kind of flat feet you have, the list provides ample choices of the best walking shoes for flat feet. Let’s have a quick recap. If you are planning to use the shoes casually and want something that doesn’t look too sporty, the Sketchers Go Walk 4 Walking shoe are a good choice for women. Not only do they provide the flexibility and cushioning you will need but they are also slip-on and easy to wear. For men, we recommend the Rockport We Are Rockin Chranson shoe. The shoe is ideal for walking on different surfaces and comes in formal colors such as brown and black making them good for day to day activities. On the other hand, if you are after something that is sportier and can be used for intense walking, the New Balance WW577 walking shoe for women and the New Balance MW411V2 for men are for you. They are designed to adapt to different walking surfaces and also have the durability and the cushioning you need for power walks. Did you find this article helpful? What is your favorite walking shoe? We'd love to hear about your ideas in the comments below. Also feel free to share this information with others looking for a good pair of walking shoes.